Users of the RR Sites Map (RRSM) application will notice recent upgrades to the popular mobile and desktop mapping system, made available by the Remediation and Redevelopment Program. The application is used to display completed or ongoing contamination cleanup sites across the state, as well as those sites that have received financial or liability assistance. The addition of “county tax parcels” to the layer list. 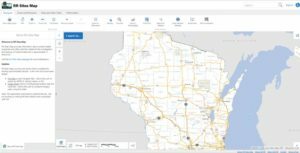 County tax parcels recently became available following a multi-year project spearheaded by the Wisconsin Department of Administration. Other improvements include the addition of a “plot coordinates” tool to the navigation tab, a “hide labels” button to the measure tool (under the draw and measure tab) and a “law enforcement contacts” button under the information tab. Comments or suggestions about RRSM can be directed to DNRRRBRRTSFeedback@wisconsin.gov.